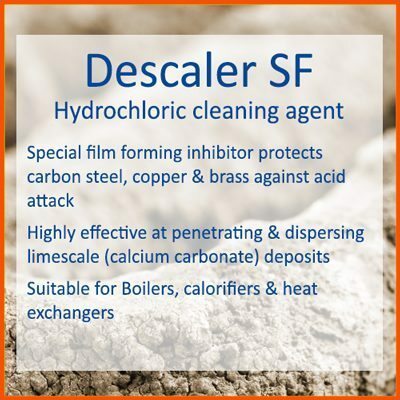 DESCALER ‘SF’ is a highly active cleaning agent based on Hydrochloric Acid and a special film forming inhibitor to protect carbon steel, copper and brass against acid attack. 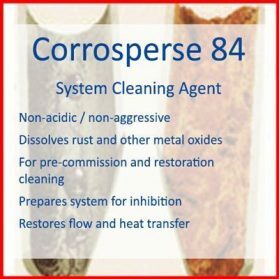 The inhibitor also serves as a penetrant and dispersant to enhance the effectiveness of the acid. DESCALER ‘SF’ also contains an exhaustion indicator. 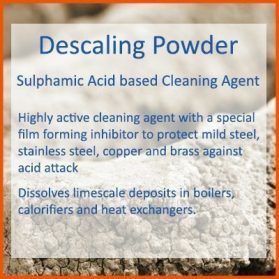 DESCALER ‘SF’ can be used to dissolve limescale (calcium carbonate) and rust deposits in boilers, calorifiers and heat exchangers. DESCALER ‘SF’ should NOT be used on stainless steel, aluminium or galvanised surfaces. 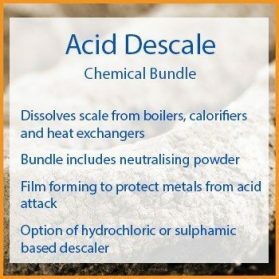 DESCALER ‘SF’ can be used at strengths between 10 and 50% and at temperatures up to 80oC, the speed of reaction being enhanced by acid strength and elevated temperature. 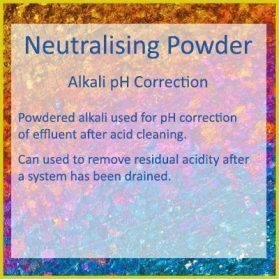 When the acid is approaching exhaustion the colour of the solution will change from red to yellow and this indicates that more DESCALER ‘SF’ should be added. Initially add 10 litres of DESCALER SF for every 100 litres of water in the circuit. This will usually cause foaming as the acid reacts with the calcium carbonate. Once the foam has died down it is an indication that either the cleaning solution has lost its strength or the scale has nearly all reacted. To test this take a sample of cleaning solution and carry out an acid concentration test. 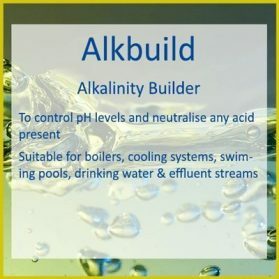 If the acid concentration test indicates a low concentration then a further 5 litres of DESCALER SF for every 100 litres of water in the circuit.